Sunday, May 19, departing at 8:30am (8:00am from the subway). Cost: 290 RMB per person (Price is the same for BJH members); Difficulty Level 3+. In Brief: The Great Wall on the west side of Jiankou has been somewhat spoiled by a buildup of trash and litter. Help us clean it up! The clean up team in 2018.
approx. 4 hours start to finish over 6km. Pizza, beer, snacks, and drinks provided after the cleanup. Join the clean up and do your part to keep the Great Wall clean and green. Unfortunately, both hikers and casual visitors are not always conscientious about cleaning up after themselves. The Great Wall on the west side of Jiankou has been somewhat spoiled by the buildup of trash – plastic bottles, cans, tissues, noodle wrappers, and worse. The pollution is disheartening, but there’s hope and ways to help stop this. Together with Gung Ho! and Patagonia, we are joining forces for a waste-free wall! 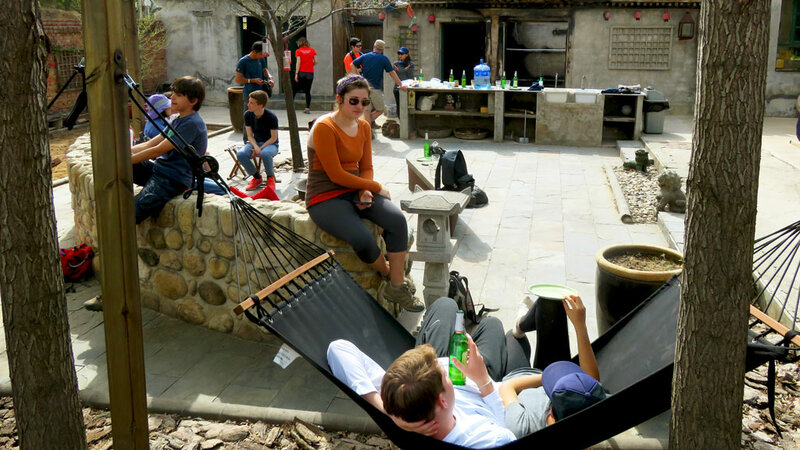 Join the clean up and do your part to keep the Great Wall clean and green, and you’ll then enjoy the reward of pizza and beer at the Gung Ho! Hut at Jiankou, courtesy of Gung Ho! Pizza. Depart from Beijing by private bus. Liangmaqiao subway departure at 8:00am, then Lido Metropark Hotel Starbucks departure at 8:30am. Hike up to the Great Wall, keeping an eye out for things to pick up. Note: some sections steep and slippery. As we hike along the trails and meet fellow adventurers, it will be an opportunity to raise awareness and set a good example. Make our way to the Gung Ho! Hut where we will weigh and log data about the waste collected. Kick back at the Hut and pat ourselves on the back with wood-fired Gung Ho! pizzas, fresh salads and light refreshments! (included in the participation fee.) We'll bring a box of beers; and other alcoholic beverages such as beer might be available for purchase for minimal charge. Start driving back to Beijing at about 4pm. Founded in 1973, Patagonia is a top-notch outdoor apparel company based in Ventura, California. The mission of Patagonia is to build the best product, cause no unnecessary harm, use business to inspire and implement solutions to the environmental crisis. 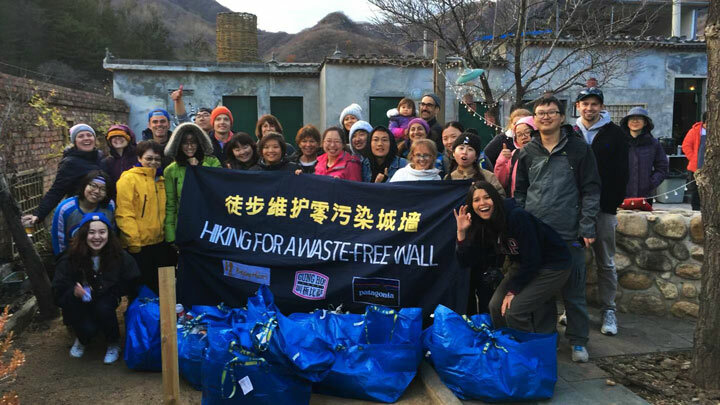 See 18 photos from the Waste-Free Wall Clean up the Jiankou 'Big West' Great Wall—overcast skies, trails covered with fallen leaves, and the magnificent Gung Ho! hut. See a set of 40 photos from a clean up hike plus post-hike Gung Ho! pizza at the Jiankou Great Wall. 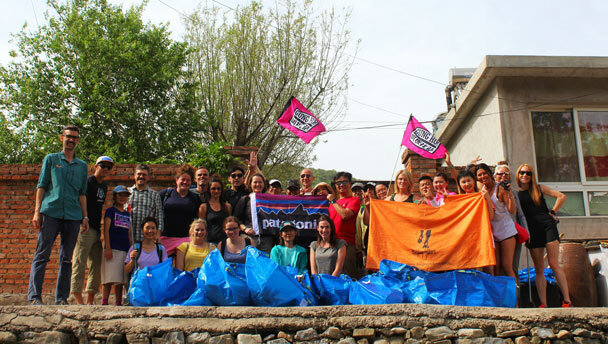 See 19 photos from our Earth Day 2018 clean up hike at the Jiankou Great Wall. 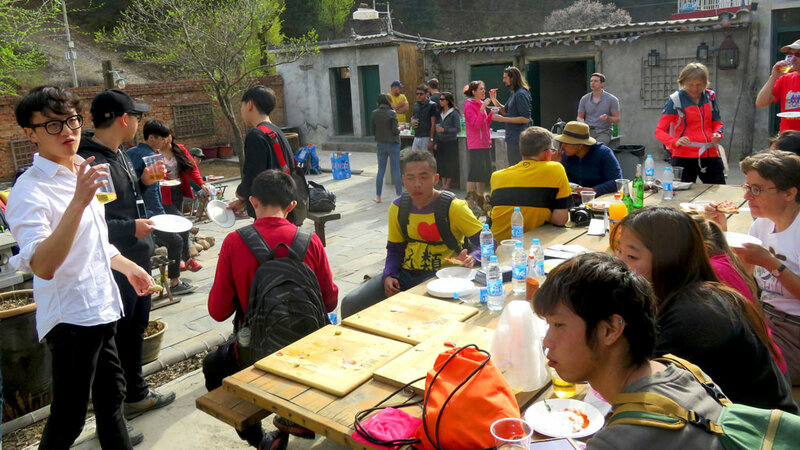 24 photos from our 2017 Earth Day clean up hike and pizza feast at the Jiankou Great Wall. See photos from our eighth annual Earth Day clean up hike. 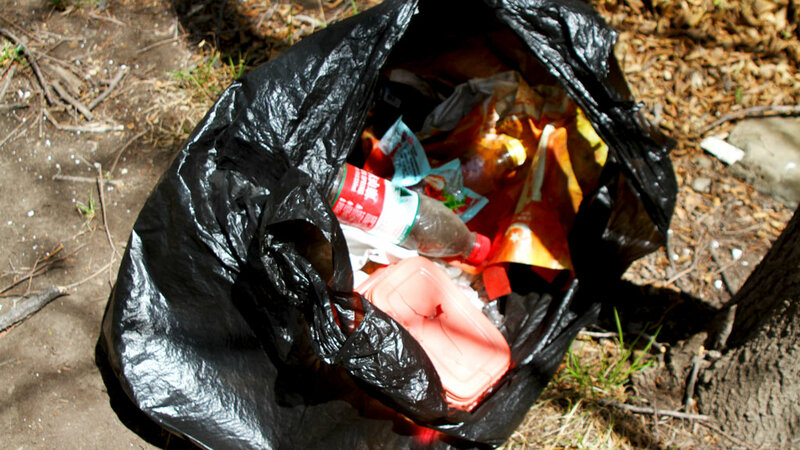 Photos from the clean up hike we did for Earth Day 2014. 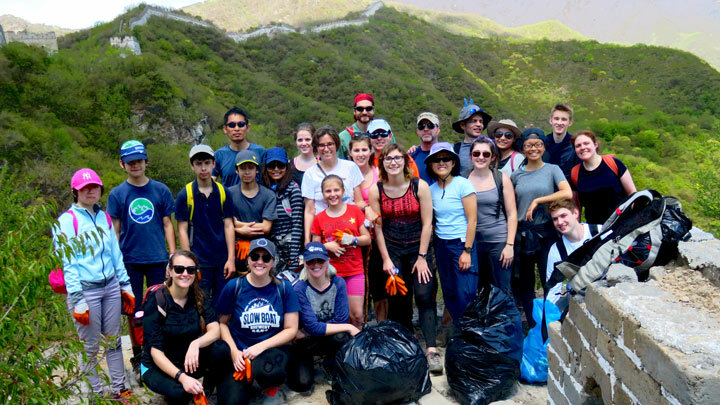 A clean and green team headed out to Dragon Cloud Mountain to clean it up. 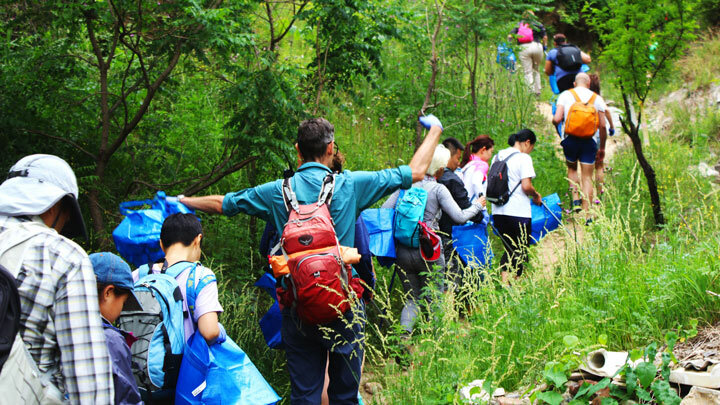 We organised several activities for Earth Day in April 2012, including our annual cleanup hike. Click through to see a few photos! In celebration of Earth Day we wanted to do our part to preserve the places we hike in, so we headed out to one of the most beautiful spots we go to and collected garbage left by other, more careless visitors. We encountered some intense weather in the form of a snowstorm that left about two centimeters of snow on the ground! Click through for photos and more! Photos and a write up of our Earth Day Cleanup hike in 2009.